At least a dozen Democrats won't back her and many more are ducking the question — all as Mike Pence stepped up attacks on the House Minority leader. WASHINGTON — A growing number of Democratic congressional candidates are bailing out on Nancy Pelosi as they try to inoculate themselves against Republican attacks on the House Minority Leader. "I'm not supporting Nancy Pelosi," Democrat Andrew Janz, who is running against Rep. Devin Nunes, R-Calif., told NBC News in a recent interview. "I think she's done a lot of good for the party; I think she's done a lot of good for the country," he added. "However, I think it's time for a new generation of leaders to go to Washington, and this is with respect to both Democrats and Republicans. I think the country, and my district in particular, is hungry for change." The future of Democratic campaigns: Exclude Pelosi? Janz is one of about a dozen Democratic candidates who have publicly signaled they would not support Pelosi since Conor Lamb won a special election earlier this month. Many others candidates have demurred on the question. Republicans have spent years trying to turn Pelosi into a boogeyman — even in elections that have nothing to do with the House or who controls it. On Tuesday, Vice President Mike Pence invoked the minority leader at length during a private fundraiser for North Dakota Senate candidate Kevin Cramer, a Republican congressman who is running against Sen. Heidi Heitkamp, D-N.D. The state does not have a competitive House race. "The Democrats want to take us back in another direction. Nancy Pelosi — I was there the last time she was speaker. I'm telling you, you don’t want to see that happen again," Pence said, according to a person in the room. "That was when they got Obamacare," continued Pence, who served in Congress from 2001 to 2013. "They thought you grow an American economy by raising taxes and expanding regulation. They want to bring it all back." In the battle for the House, Republicans have made it clear they plan "put Nancy Pelosi on trial and prosecute the case," as the leader of one major GOP super PAC told NBC News. So some Democrats are ducking out of the courtroom. In Pelosi's home state of California, arguably the central battleground for the House this year, a survey of 34 Democratic candidates by The Mercury News found only two willing to publicly commit to voting for Pelosi to be their leader if they make it to Congress next year. The goal of the Republican attacks on Pelosi is both to mobilize the GOP base as well as to try to convince swing voters that the Democratic candidate, no matter how much they profess independence, will ultimately empower the San Francisco liberal who leads her party in the House. Janz decided to pre-emptively speak out on Pelosi, as did Democrat Paul Davis, who pledged to oppose her the day he launched his campaign in Kansas last August, calling for "new leadership in both political parties." While congressional leaders are often unpopular with the public, Republicans note her approval ratings are particularly weak, pointing to toxic numbers among independents and relatively tepid support even from Democrats. Lamb won his special House election by just 627 votes, and Patrick Murray, the director of the Monmouth University Polling Institute, said his disavowal of Pelosi could have been the decisive factor. "There's no doubt in my mind that he got at least 800 votes out of that district specifically from conservative-minded independents that were assured he was not going to support Pelosi," Murray said. That ditch-Pelosi-strategy makes sense in a deep red district like Lamb's or Nunes', which President Donald Trump won by 10 percentage points in 2016. But Murray cautioned breaking from the national party may not be a good idea in a district where getting Democrats to turn out is more important than converting moderates. Republicans still tried to tie Lamb to Pelosi, as they have in almost every competitive congressional race since Trump's election. "Pelosi knows Conor Lamb will follow her liberal heard," said the narrator of one ad from the National Republican Congressional Committee. "Backed by Nancy Pelosi, Lamb will be a vote for her liberal agenda of higher taxes, more job-killing regulation, and a weaker military. Conor Lamb, he's with her, not us." That line of attack proved more effective in Georgia's special election last year. Democrat Jon Ossoff lived outside the district, had a relatively thin resume, and declined to cast aside Pelosi, making himself susceptible to GOP admakers trying to present him as an out-of-touchy lefty. Rep. Seth Moulton, D-Mass., a Pelosi critic who canvassed for Lamb, said the issue was on voters' mind in the Western Pennsylvania district. And hoped other Democrats would take note. "We heard this from several people whose houses we visited," Moulton said. "The people want change not just with the Congress getting rid of Republicans, they want change in the Democratic Party as well." 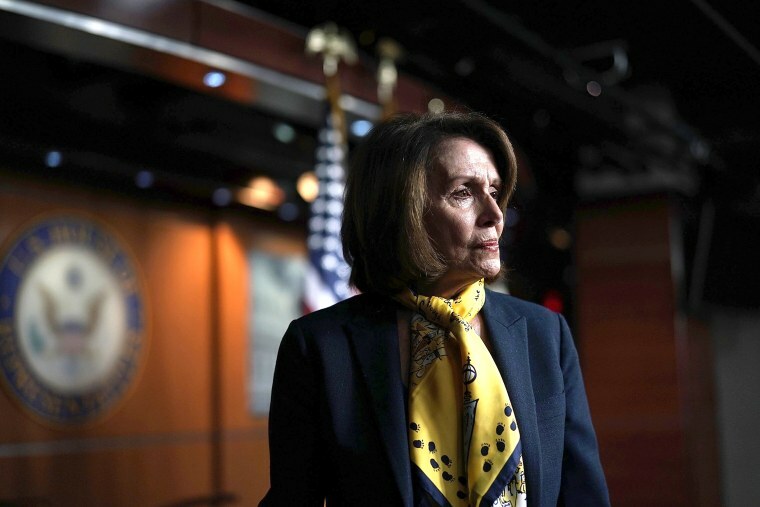 Pelosi herself has not yet asked any Democratic candidates for their support, a Pelosi aide told NBC News, suggesting that retaking the House overrides any other concerns for her even as some senior members of her caucus have called on her and other party leaders to step aside. Pelosi is a prodigious fundraiser and proven tactician, as her allies are quick to note. And she's never lost an internal party vote, despite a career in leadership that has spanned decades of ups and downs for her party.